I found out about this car recently when I was researching Alfa's. Click the image to get a good look. It's quite something. 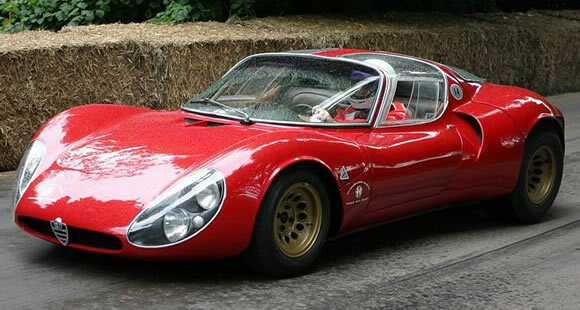 Wikipedia tells me only 18 were built with the first one being built in 1967 based on the Autodelta Alfa Romeo T33. This was a very fast and expensive car for it's day and had a 2 litre V8 developing 230hp in road trim. 0-60mph was ok at 5.5sec's but the 160mph top speed is still awesome. Imagine the noise of the V8 at that speed. Was really amazes me is how light it was - 700kg dry. That is quite incredible. A real, beautiful Supercar.